Fast-Trac Designs is proud to announce that we have been published in the July issue of the popular sign magazine Sign Builders Illustrated. The issue covers a project that we completed in April of this year for a color change wrap on a Mercedes. Jeff Wooten of Sign Builders Illustrated wrote up the article and did a great job at emphasizing the detail it takes to complete a color change wrap. We are very excited and thankful to the magazine for giving us this opportunity for the second time (Fast-Trac Designs is also in the December 2012 issue.) Go ahead and check out the links to see Fast-Trac Designs published. Here is a partial wrap we produced for Residential Gourmet, a gourmet food delivery service. We created a custom design that would stay in our clients budget as well as help him target his own customers. The wrap is considered partial because we did not wrap the entire van. The main wrapped portion of the vehicle is in the back where photos of gourmet plates are highlighted along with contact information. We look forward to wrapping the rest of this customers fleet with many more gourmet wraps. For more information on Vehicle wraps, Screen Printing, Signs and Graphics contact Fast-Trac Designs! When we say custom wraps we mean it. This is one for the books and is certain to get the looks with its unique design and fine detail. Fast-Trac Designs designed, printed and installed the wrap with our senior designer, top of the line printer, 3M material and pro installers. This wrap has a rough and tough look in the front with a faded black design and flames which perfectly transition to the mustang horse then fading to a soft frill design and then into solid orange. Our customers reaction to her new Mustang wrap was priceless and we are so happy she is pleased with the final outcome of her custom wrap. Your custom wrap could be next! AEA Plumbing recently came to Fast-Trac Designs to have their Ram 2500 wrapped with a straight forward yet attractive design. The main features would be the subtle background image of a shower head with water. This image is perfect because it is not over powering the design and it relates with what the wrap is selling. Another attraction to this van wrap is the vivid neon green that is dispersed throughout the wrap and not overbearing to look at. Finally most companies add a tag line or catchy slogan to any of their advertising and this wrap features two! We found this unique and also another way to show off more of your companies traits. Overall we are fond of this wrap and the customer was highly satisfied and that gives it a ten. Your wrap could be next! Contact Fast-Trac Designs today for your wraps, apparel, signs and graphics! The time is here for all of the Summer events to begin and it all kicks off with the annual 4th Of July Celebration at Lake Pleasant. Fast-Trac Designs will be a part of the event again aiding in hosting the all makes and models vehicle cruise-in. Some other main attractions will be the FREE activities for kids, Water slides to keep cool, food vendors, bounce houses and LIVE music! 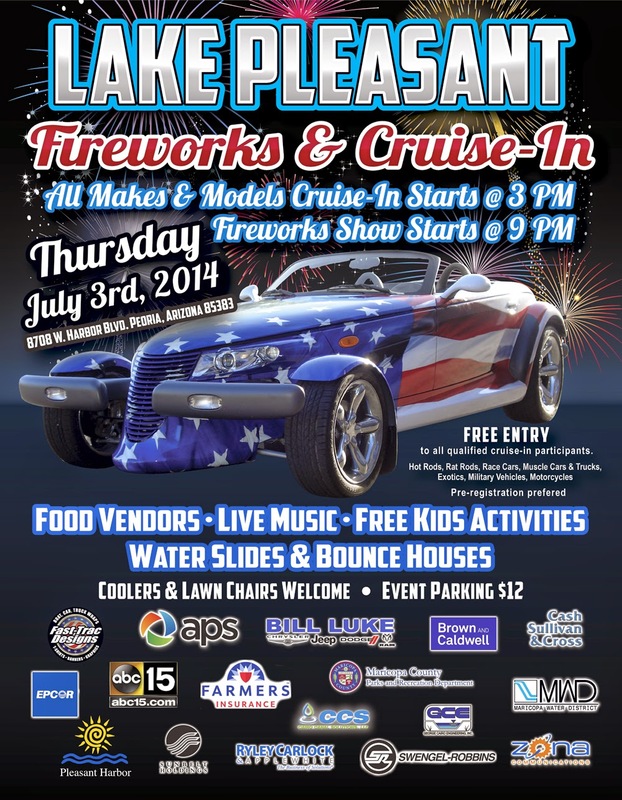 We are very excited, and looking forward to having a great time this year at Lake Pleasant's 4th of July Celebration.